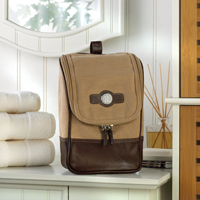 A great Christmas gift idea for him, this personalized canvas and leather deluxe travel kit is a must-have accessory for traveling. 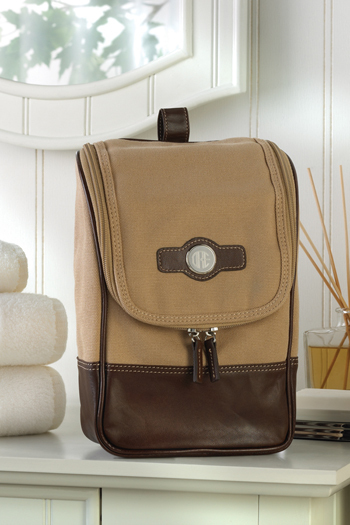 The tan canvas exterior includes a sturdy leather bottom and leather accents and features a zippered front. Stands on counter or hangs by included hook. Personalize the silver-toned disk in the circle monogram font shown. SIZE: Measures 7" x 11" x 4". 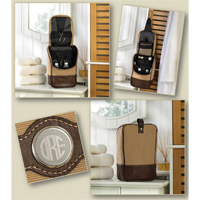 PERSONALIZATION: Personalized with three initial monogram (first name initial, last name initial, middle name initial).